Though no one knows the exact Oysters Rockefeller recipe, a classic dish created in1899 by Antoine's restaurant in New Orleans and a carefully guarded secret recipe, we do know it's loaded with richness from butter and cheese and piled high with greens. It's serious goodness. We've made numerous versions of it at home, but our favorite (and easiest!) version contains just five ingredients (including the oysters) - and not one of them is butter! But don't worry, this twist on the classic recipe is just as delicious and, best of all, you won't feel guilty eating a hungry man's share of them - which you just may do. I also love our version because there's no measuring of ingredients, just use as much or as little on each oyster. 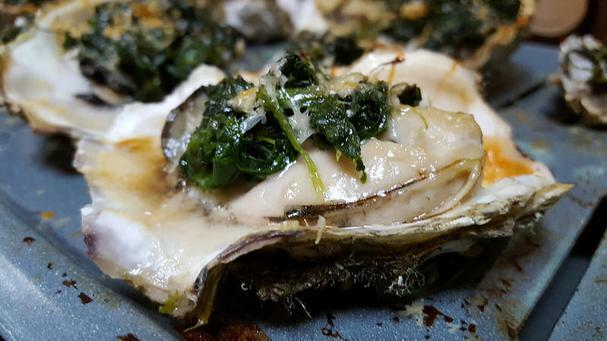 Place freshly shucked oysters in their half shell on a broiler sheet. Sprinkle with a bit of chopped shallots on each oyster along with a bit of spinach and a splash of Pernod. Top each with a bit of Parmigiano-Reggiano, then place the broiler sheet on the top shelf in the oven and leave the oven door ajar. Broil oysters for about 3-4 minutes or until the cheese is nicely golden brown. Watch carefully so you don't burn them! Enjoy with Champagne or the beverage of your choice.